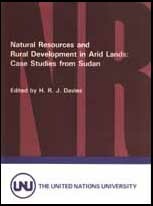 This report was prepared within the framework of the United Nations University's Programme on the Use and Management of Natural Resources. The views expressed are those of the authors and not necessarily those of the United Nations University. Mention of the names of firms and commercial products does not imply endorsement by the United Nations University.